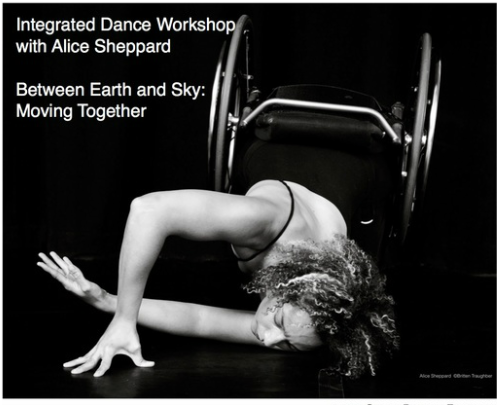 CRIPSiE regularly runs public educational workshops and performances around the themes of integrated dance, disability arts, accessible creative methods, and disability-inclusive community-building and programming. We organize and host several workshops each year on these topics. We organize public "teach-ins" or "talk-backs" in association with all of our performances in order to facilitate learning about integrate dance. We run such workshops and performances for other non-profits, community groups, service organizations, schools, public events, festivals, and conferences. To book a performance, or educational workshop contact Lindsay Eales here. A basic one-hour company workshop or performance is $250 (plus travel expenses if outside of Edmonton). Costs may increase if you desire content or length to be tailored to your needs . Contact Lindsay for a quote. CRIPSiE offers workshops, consultations, and venue audits to help any member of the public to run more accessible and inclusive events. We perform dozensof audits and consultations each year, mostly for non-profit organizations, artistic festivals, and conferences. CRIPSiE's expertise in this area is based not only on over a decade of experience producing accessible art, but also decades of collective experience in navigating the world with a wide variety of impairments and experiences of marginalization. Various CRIPSiE members also have formal training in this area, including Occupational Therapy certifications, graduate degrees in Disability Studies and Adapted Physical Activity, and internationally recognized training in integrated dance. Anyone can book an audit, consultation or workshop on Accessibility by Contacting Lindsay for a quote. These services are delivered on a sliding scale: generally it costs $100 per (small) venue. CRIPSiE offers company classes at least once a year. Classes will use improvisation to explore composition and dynamics. Dancers will have a chance to explore their individual dance and adaptation skills, and practice moving with a group. These classes are open to everyone. We encourage people interest in dancing and in choreographing to attend. CRIPSiE offers ongoing mentorship and other supports to up three emerging choreographers at any given time, in order to help them to create a short piece of integrated dance choreography. Interested artists from inside and outside our community will be invited to submit a proposal, in fall 2017, to choreograph a piece for our upcoming show in October 2018. Contact klacton@ualberta.ca to register. They will be supported with mentorship, workshops, space, performance opportunities, and dancers from the CRIPSiE ensemble.